CF #28 was pretty good.Jimmy Deans,Beyond the call of duty,LIAR party,demonic(well,more demonic) Teletubies,Taxidermist returns.Good stuff. BTW,will #29 collect Doomsday Scenario? Book 30 will be all Doomsday. All Doomsday? Both parts, Prog and Meg? That's going to be one helluva Case File. I'm going to have to start some weight training in preparation for getting it home from Waterstones and/or FP. Groovy. Thanks for the input. I've read to 15, not 16. I lied. 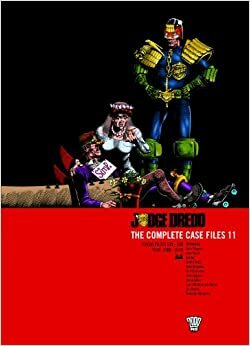 I liked the fact that things got a bit political but so far my preferred things about Dredd were the crisp b&w art (Ron Smith is my favourite) and the OTT satire on mc1 life. The last few felt gloomy and I've enjoyed the art much less in colour. I've enjoyed the Dredd I've read in the progs I've picked up over the last couple of years, though. Ill give 24 a bash. Thanks again! Number 17 has the megaepic Judgement Day which is, IMO, well worth your time. In the process of filling up holes,(I still got 9-13) I finished CF8.It was okay,but I get the feeling the creators were running out of energy.Dredd Angel was funny.Another revisit of Cursed Earth.Dredd does some questioning of his own actions.City of the Damned lasts just a bit too long.Hunters Club is kinda weak,I have to say.Brisco's assessment is probably my favorite story in this file. An okay volume,but not the most spectacular one. #9 was pretty solid.Letter from a democrat and Midnight Surfer are obviously the strongest stories.Most of it are shorter stories,that mostly work.I liked Nosferatu. Recently finished CF 28 - the most recent one - and I think, story for story, it's one of the best ever, right up there with my go-to favourites of the original Wagner/Grant era. All the stories are written by John Wagner, which helps to keep the quality high, of course! But there's some cracking art and it's basically full of those little 1 or 2 part comedy gems. The only complaint I can make about the Case Files is that they don't PUT THEM OUT FAST ENOUGH! That and I hope there is a follow up story to Pup Fiction. Wanna see some characters at the least get CUBED! #28 was a good collection of Fun and (somewhat) Serious stories. If only we could clean our political parties like Dredd can. CF #10 wasnt bad,but nothing really essential here.Sequels to some older stories,including the first one ever. Some,like Michael Jackson and Jack the Ripper stories,are kinda fun,but a bit lazy.Judge application is probably the high point. Cover of CF #11 is kinda confusing to me.Why a simp who only shows up in one story?Why not Chopper,or FairlyHyper Man or something Revolution related?But the inside of the volume was pretty freaking good. Well, Nobby Klunk (and wife) do show up for a sequel story in a few books' time, and he's the first simp we ever met - but agreed, it is a bit of an odd choice of cover image. If nothing else it makes zero sense out of the context of the story. They do show up in the next volume,true. And now with #12 and #13 done,I caught up with all the Case Files.Yey,me. Klunk and co area good example of something I feel has been missing from Dred stories for awhile now. Reoccurring none Judge characters. Mrs. Gunderson has been appearing less frequently these last 5-10 years, for awhile it looked like Sensative Klegg would be stepping up. It's a large oart of what makes Dredd such a great strip, IMHO. Agreed there, could always use some more Max Normal too, classy gent.